MILWAUKEE – Harley-Davidson workers at factories in Wisconsin are expected to vote on a new contract Monday. The existing seven-year contract, which was ratified in 2010 and went into effect in 2012, was scheduled to expire today but was extended for one day. 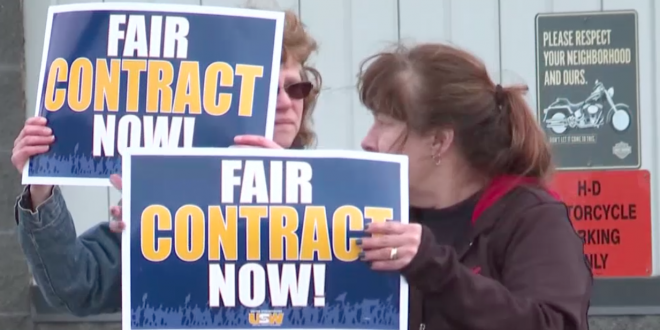 Union employees spent time last week outside the Menomonee Falls and Tomahawk plants rallying support for a new, fair contract. According to the “Journal Sentinel” newspaper, members of the United Steelworkers of American Local 2-209 have been concerned about possible layoffs. Employees haven’t received a raise in seven years. Meanwhile, WTMJ-TV reported that workers were expected to get contract negotiation packets to look at on Saturday in advance of the vote. Both the company and the union have been tight-lipped about negotiations, with the company merely confirming last week that negotiations were taking place. The expiration of the current contract comes at a time when Harley-Davidson sales are slumping – down 10.2 percent in the United States in 2018, compared to 2017. The company closed its Kansas City factory last year after sales dropped 8.5 percent in 2017 from 2016.